After re-engaging with the international community for the last eight years, Myanmar has been through many ups and downs. In recent times, media attention has focused on its Rohingya crisis, resulting in diplomatic condemnation and continued controversy. Despite all these, the country continues to be a point of attraction for foreign investment and development. With a young population of 54 million at a median age of 28 years, Myanmar holds significant potential and in need of support in all areas of infrastructure, especially with its social and community development. With so much at stake and so little being clear, foreign foundations and philanthropists are unsure of how to proceed. With strong interest in Myanmar amongst its membership, APC produced the research, “Giving to Myanmar: A Guide for Asian Philanthropists”. This is part of a series of Cross Border Giving Guides, which act as toolkits for philanthropists going into countries that they are not so familiar with. The guides provide a landscape review of the country, including recommendations from experienced practitioners on the ground, relating to the regulatory framework, cultural issues, sources for information, and case studies. APC is partnering with WINGS to launch the guide through this webinar to expand the impact of our research beyond our membership. The key recommendations of the guide will be presented by the main author, Dien Yuen, a Managing Director and Philanthropy Advisor in the San Francisco office at Evercore Wealth Management. 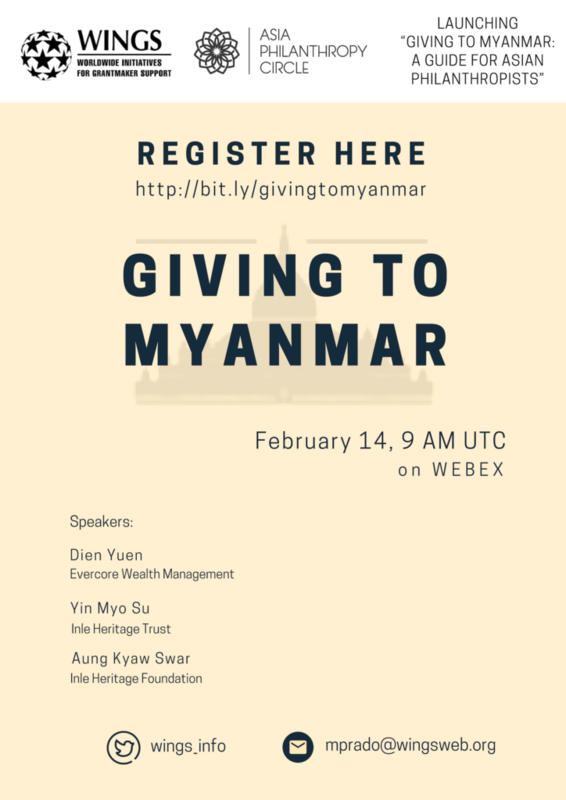 Our local Burmese partner, Inle Heritage Foundation, will also be sharing their thoughts on foreign philanthropists working in the country, and on the current situation in Myanmar. The webinar will then be open for Q&A from participants. The recording for the webinar is available via WINGS youtube channel here. Dien Yuen is a ManagingDirector and Philanthropy Advisor in the San Francisco office of EvercoreWealth Management. She is responsible for providing customized philanthropicadvisory services to individuals, families, family offices, as well asnonprofits, foundations, and institutional clients. Prior to joining Evercore, Dien founded Kordant Philanthropy Advisors, a boutique philanthropy research and advisory firm serving families and institutions in the U.S. and Asia. Before starting Kordant, she was Chief Philanthropy Officer at Give2Asia, where she served as a resource to donors wishing to give overseas and built the organization’s business development unit. Prior to that, she managed the portfolio of large and complex planned giving programs for various nonprofit institutions as Vice President & Senior Trust Officer at U.S. Trust. She has also worked at IIT Bombay Heritage Fund, Asian Pacific Fund, and the American Cancer Society. Founder & Director of the Inle Heritage Trust, YinMyo Su is the managing director of the Inle Princess Group, and founder of theInle Heritage Foundation. She is passionate about women’s empowerment, economicdevelopment, heritage and environmental preservation, art, culture and citizenengagement. Furthermore, Yin Myo Su has taken a leading role in protection ofthe unique and at risk marine life of Inle Lake. She is also a chairperson ofthe Inle Heritage Hospitality Vocational Training Center and a founder of InleHeritage Private School. Aung Kyaw Swar,the Principal of Inle Heritage Private Primary School and former Principal ofInle Heritage Hospitality Vocational Training Center under Inle HeritageFoundation. Kyaw Swar is a leading figure in sustainable tourism in Myanmar. He is also running “A Little Eco Lodge” atraditional style eco-friendly lodge, “A Little Loom” a weaving center focusedin preserving and training Inle special weaving technique, and “A LittleTreehouse restaurant”.